Hi guys lately I have been busy so I haven't been around as much. I was asking about making a score for a game by clicking a button. So here is the example with instructions. the source code to try on your computer. This makes a button appear on the screen with the words Click Me. the program what to do with it. This links the score to the button. P is equal to the changes in the score. Remember the id="output" now P controls the score. score+=1; means the score will go up by 1 point everytime its pressed. 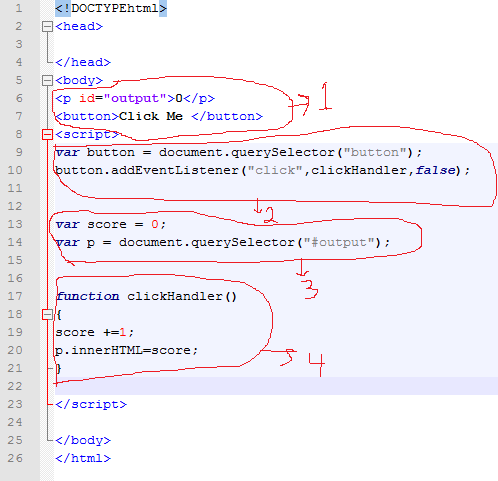 p.innerHTML=score; This means the value of p will be tranfsered to the score so it displays onscreen.